Alison, Derek, Lauren and Connor would like to welcome you to our family run, 3 Star, newly refurbished Guesthouse providing bed & breakfast accommodation. We are totally non smoking for our guest's safety and comfort. All our rooms are en suite, have a colour television, fair trade tea and coffee making facilities and hairdryer. We also have a lounge/dining room that has a television in for your use. We do not allow take away food to be eaten in the bedrooms, however you are welcome to eat in the lounge. There is ample free on street parking, without any time restriction, and many of our guests park up for there stay and walk or bus around the area! We are about a 7 minute walk to the beach and a 15 minute walk into town. We are also on the main bus route with the stop only a few yards from the front door. The train station is a 10 minute walk away. 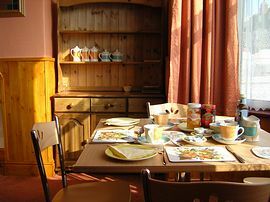 We are a friendly family run Guesthouse..
We serve a breakfast we hope you will enjoy and set you up for the day! Special Diets Provision: Special diets are catered for. Vegetarian breakfast option, and we will try to cater for any other requested if notified prior to arrival. Smoking Facilities: Smoking is not allowed. Totally non smoking throughout. From the Dorchester By Pass: A35, Football Stadium roundabout. Turn onto the A354 heading towards Weymouth. Follow the A354 down the steep hill to your first roundabout. ( Approx 4 miles) Proceed straight on at this roundabout, which will put Morrisons Superstore and petrol station on your left hand side. Carry straight on, past the Famous Old Spa pub on your Right and Lidl store on your left. Keep going and you will come to a slight hill with shops either side of the road. You will see Tesco Express and the Royal Oak pub on your left. We are just past these shops on the right hand side. 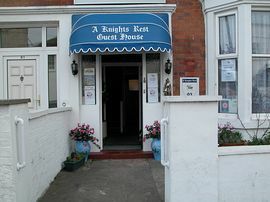 Easily identified by our blue and white canopy with A Knights Rest Guesthouse printed on it. All parking is on the roadside and is all free, without any time restriction. So you can park the car up for the duration of your stay if you like! We are on a major bus route, with buses runnning approx every 10 minutes into town. By Rail: We are approx 1 mile from the station. A short bus or cab ride away. 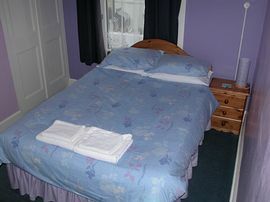 Single Room: From £25.00 to £40.00 per night. 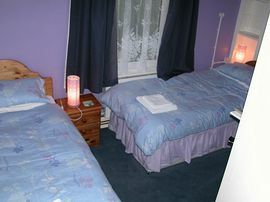 Double or Twin room: From £46.00 to £60.00 per room per night. 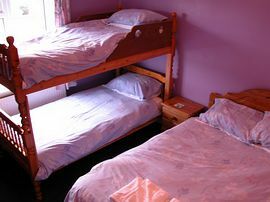 Family Room: From £69.00 to £90.00 per room per night (based on 2 adults and 2 children under 12).